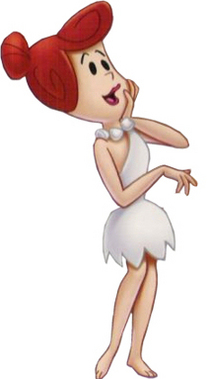 Wilma from the Flintstones made me happy when I was a little girl – and she still does! She was great at expressing herself (especially if she was mad at Fred), but she was also quick to laugh and move on. I’ve heard it said that you were “your most true self” when you were very little. Gretchen Rubin, who wrote “The Happiness Project” reminds us to “Be Ourselves”. As an adult, I find myself wrestling with “chronos” time (the Greek word for time that means chronological, sequential time) while longing for “kairos” time (the Greek word describing how events unfold at the perfect time). Many of my lists and tasks as wife, mother, business owner, homemaker etc. are done in chronos time, it’s my default mode. In fact – my temperament type, personality and upbringing all point to this rather driven way of being. Yet I aspire to shift into kairos, which is a space where faith lives. This is the space I was born into and occupied effortlessly for the first years of my life. I can be “Linda” and still relax into the moment, if I can remember how. I need to consciously choose to believe that I’m not behind, that things will work out, and that life is bigger and more forgiving than my limited and harried race against the clock. I was raised by a woman who was into the women’s lib movement. She went back to school to get her law degree with 4 kids at home. She would flit off to fabulous destination spa resorts while my dad was on hunting trips. She was creating a new kind of role for a woman that was so different from her fore-mothers. At home, mom went to The European Health Spa – a glorious facility, and the only place in the Twin Cities like it at the time… the 70’s. She would sneak me into the spa at 15 (pretending I was 18), and I would sauna, steam, swim, get a massage and drink smoothies to my heart’s desire. Who would have known that I would own a spa myself someday? I found pleasure in those quiet hours at the spa as a girl, the same way I felt swimming at the cabin, hunting turtles, picking fresh berries in the woods, or sitting on grandma’s lap. The common denominator in these experiences was the joy I felt. I fancy myself as being in the “happiness business”. At the spa, time disappears. No lists to complete, people to please, or tasks to perform. Just you, your breath, your thoughts and a myriad of sensations. A safe place to go where your contentment is numero uno. And I get to come along on the journey! I set the tone, the mood – create the space for you to be…just you. That’s not to say that spa-going is the end-all, be-all to self discovery or enlightenment; it’s just one simple, uncomplicated way, one place to discover and be you! I’ve found that serving others through the art of touch and personal grooming is one of the many things that brings me happiness. Now, your job is to figure out what brings you happiness, can you remember? – once you’ve done that, it’s easy to share! « Why Star Brows Has A Killer Brand–And You Can Too!